Christine Hanna just fell into the wine business, due, to her fathers dedication and devotion to farming. Hanna Winery was founded in 1985 by her father Elias, get this, a world renowned cardiac surgeon, who settled in this country from Syria. His goal was to continue the family heritage of sustainable farming. He wanted to teach his children where the food they ate came from. They should understand and know the land and the earth they live on. By living on a working farm, Dr. Elias Hanna believed his family would follow his footsteps from his youth in Syria to his new homeland, America. In the 1970s, his dream came true when he purchased twelve acres of land in the Russian River Valley of California. The land, which came with a dilapidated farmhouse, was their weekend getaway. They farmed the land, grew vegetables, raised farm animals, grew grapes, and made wine. As the years progressed, the knowledge of the land and the quality of the produce hit a plateau. By 1985, the table wine that the family made had developed was now a quality wine that could and would be sold to outsiders. That is when the Hanna Winery story began. 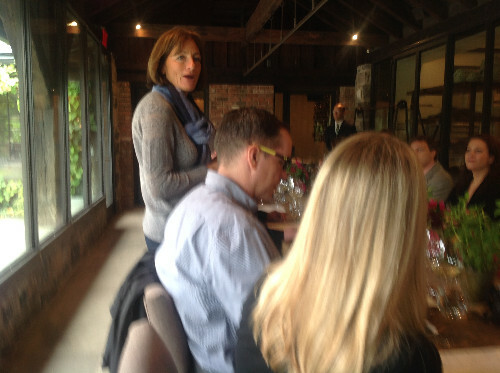 I had the opportunity to spend the better part of an afternoon with Christine Hanna, president of Hanna Winery. We met at Blue Hill at Stone Barns near Tarrytown, New York, where Christine wanted to show me what a working, sustainable farm was all about. Blue Hill has it all,vegetables, flowers, a farm store, chickens, sheep and a restaurant that serves mainly what grows on the property. The farm is sustainable and mimics the values that Christine's father taught his children. Christine has prospered from her fathers philosophy and heads the Hanna Winery, which through the years has grown to 250 acres set aside for vineyards, from the 600 acre property. Sustainable farming exists on the properties owned by the winery in Sonoma County's Russian River Valley, Alexander Valley and the Mayacamas Mountains. Hanna has evolved into an estate that blends the viticultural diversity of fruit collected from the various properties into one winery. The job to coordinate the grapes into the quality wine that Hanna produces is that of veteran winemaker, Jeff Hinchliffe. Christine overseas the operation of the winery, which has grown since 1993,when she took over operations, from 1000 cases to 50,000 today. In Christine's spare time, she has written an essential cookbook, published by Chronicle Books, titled, "The Winemaker Cooks". She explores cooking using locally grown ingredients. The impressive book, with her photo on the cover, exemplifies the philosophy of her father. One of my favorite and overly simple recipes from Christine Hanna's "The Winemaker Cooks" is her tasty and fun to make "Grilled Eggplant Salad". Light a grill. (I used a grill pan on top of my stove) Brush the eggplant with the olive oil and season with salt and pepper. Grill the slices over the heat until softened and lightly charred in spots, about 10 minutes. Let cool slightly, then cut into bite size pieces. In a large bowl, whisk the balsamic vinegar and lemon juice with 3 tablespoons of the olive oil and season with salt and pepper. Add the eggplant, cherry tomatoes, arugula, feta cheese and mint; toss gently and serve. Christine suggested that the perfect pairing for this dish is the Hanna Winery 2014 Russian River Valley Sauvignon Blanc ($19), a cool climate wine that is crisp, tropical and has the grapefruit-melon surge on your palate. Obviously stainless steel fermentation gives this wine the competitive edge. 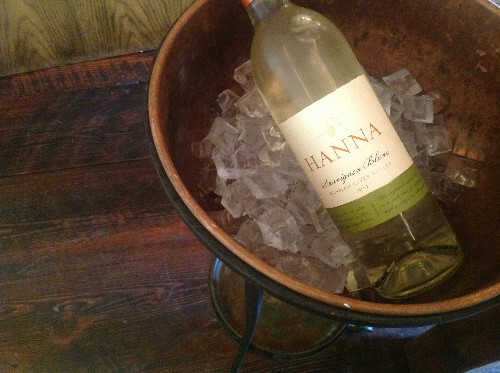 Sauvignon Blanc counts for half of Hanna's wine sales. On the other end of the white spectrum is the 2013 Russian River Valley Chardonnay ($22). The grapes, like the Sauvignon Blanc, are harvested at night and are delivered to the press in the wee hours of the morning. The result from the cool grapes is a well balanced, wine whose presence contains just the right weight of fruit, acidity and oak. Its rich and creamy flavors favor apple and pear. 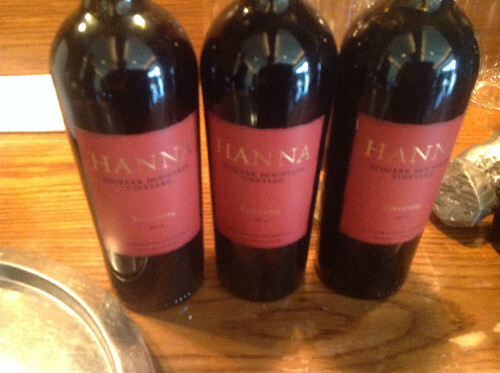 Hanna Winery produces one of my favorite Cabernet Sauvignon's from the Alexander Valley. The 2013 is a perfect example. At $42 a bottle, the 75% Cabernet Sauvignon, 20% Malbec and 5% Merlot blend outshines the competition with its ripeness of dark fruit, specifically, plums, currants, dates and blackcurrants. This wine has happy tannins and will, in time, become silky and velvety at its peak. The 2013 Bismark Vineyard Cabernet Sauvignon ($44) grapes are grown at the highest vineyard in Sonoma, according to Christine, the views are unmatched, as is the wine. It is made from 76% Cabernet Sauvignon grapes; 19% Malbec, 4% Petitie Verdot and 1% Cabernet Franc. The wine is overly intense. With a dark fruit tattoo it imprints on your palate with inky jam, leather and cocoa. Hanna wines are distributed through the Terlato Wine Group, whose philosophy is simple,"put quality first". And that is what the Hanna Winery is all about, "quality first through sustainability".